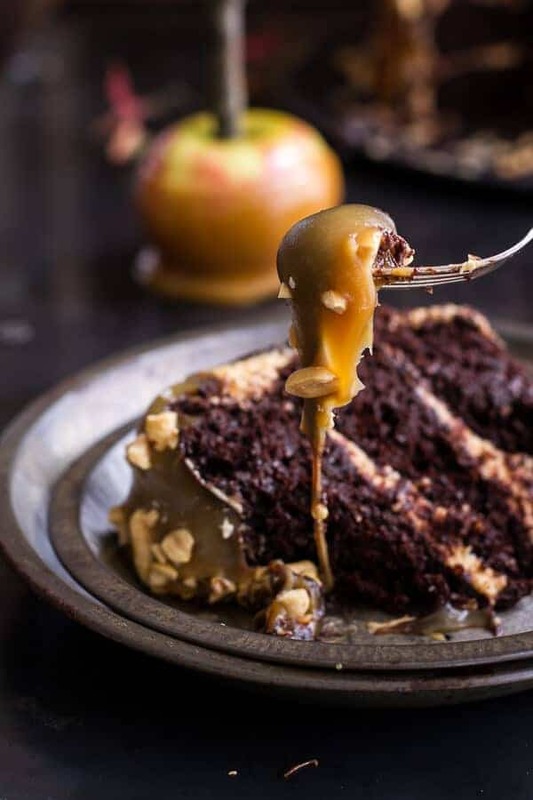 Salted Caramel Apple Snickers Cake. You guys, you guys, you guys. I maybe, kind of sort of, got a little carried away with this Salted Caramel Apple Snickers Cake. But sometimes I really just cannot help myself. Getting carried away in chocolate is always a fun thing. And this cake? It’s my favorite fall recipe to date. I freaking love this cake! I kind of have a lot to say about this cake (how could I not!). Please bear with me as I ramble (and ramble) and try to convince you that you need to make this cake. For one, I realize that this cake is well, totally high maintenance. I am not going to sit here and try to tell you that it’s quick and easy because that would just be a lie. This cake takes a little TLC for sure, but I think it’s a cake that is worth it. Maybe it’s only a once year cake, but that is what makes it even more special. And the time of year to make it is NOW. I am thinking Halloween, but Thanksgiving would work too. Personally, I think it’s geared more towards Halloween. It has a little spook factor to it, the caramel apples and the whole Snickers thing makes it a dead ringer for Halloween, when everything is all about candy. Although, I didn’t actually use any Snickers in this cake, it’s just Snickers flavored…. but it’s better than a Snickers. Here’s the deal, the cake part is simple. It’s just a spiced apple cake, but made chocolate. I know that is not really typical, but who cares, it’s good. The cinnamon is delicious with the chocolate and the sweet flavors of the apples. Oh, and since this cake is full of applesauce that means it’s healthy, right?? Ok, ok, fine, it’s not even close to being healthy, but hey I had to try. And hey, it’s a celebration cake so the calories don’t count anyways… reason number 101 as to why I love the months of October, November and December. These are the months when food can be whatever we want it to be. Yes to the yes. Once you have the cake all baked, it’s time for the caramel. Now the caramel we are dividing into two parts. You are going to start off, by making one big pot of salted caramel sauce. We only need one cup of the caramel sauce, so we remove that from the pot, set it aside to cool and then reserve the remaining caramel sauce (just leave it in the pot you cooked it in) for later on in the recipe. 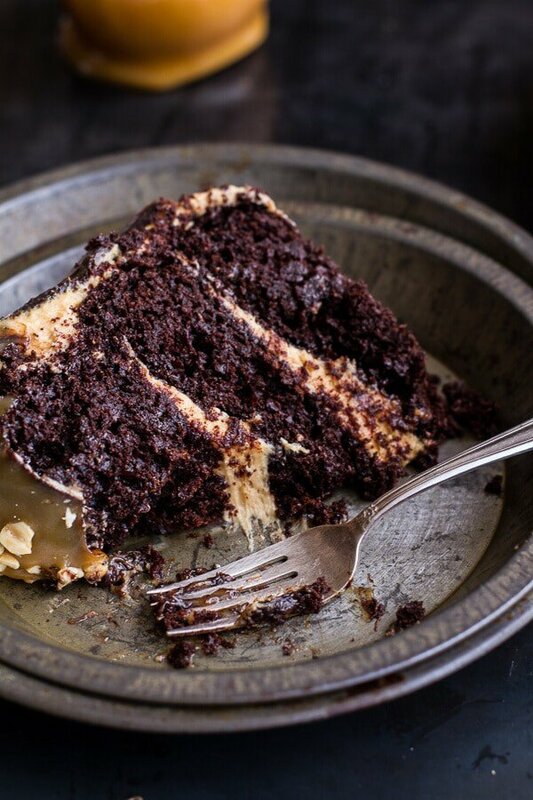 We need the one cup of salted caramel sauce for making the frosting and drizzling the cake layers. The rest of the caramel in the pot will need to be cooked again and brought to the proper temperature to coat the apples in. Once the cake is all assembled you will cover the cake and apples in this caramel. This is the very final step though. The next step is the frosting, which may just be the best part. The frosting is addicting you guys. If you are a frosting lover, you may just want to double the recipe. It’s “spoonful worthy” good. The frosting is sort of the “nougat” and peanut layer of the cake combined into one. I really did not want to take the time to make two sets of frosting for this cake, so I just combined them into one. It worked perfectly, if I do say so myself. It’s sweet, but with the perfect amount of salt to balance it, and then it’s super peanutty, super creamy and so fluffy. AKA, the best frosting ever. After you have made the frosting, you frost that cake ALL OVER. 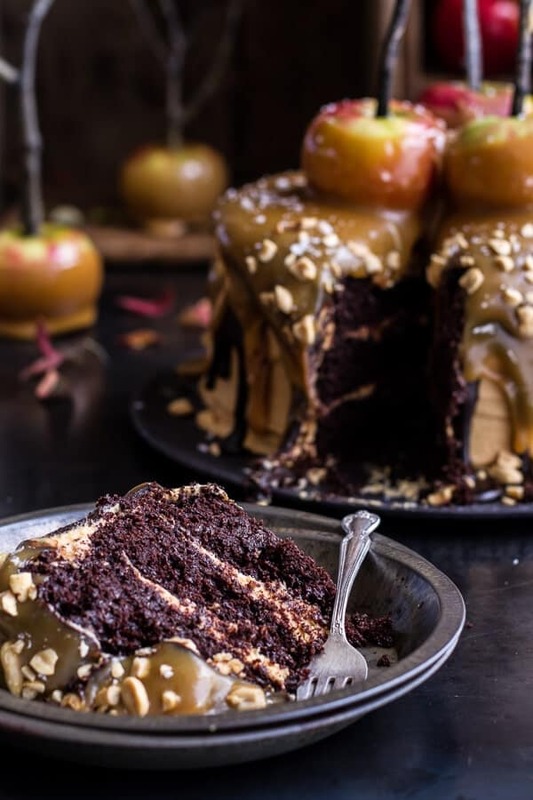 Get every nook and cranny, then drizzle every inch with that reserved one cup of caramel sauce and cover those moist chocolate cakes in full on deliciousness. Don’t worry about the frosting looking perfect because you will be covering it in a layer of chocolate and then a thick layer of caramel. Totally insane. The bummer part to this recipe is that it requires some chill out time in the fridge. The first chill time is short. You just want to keep the frosted cake in the fridge while you make the chocolate coating. It’s no big deal. But the second chill time is more important. Once you have poured the chocolate coating (which is just chocolate ganache) over the cake, it is best if you can keep the cake in the fridge for at least and hour and half. I recommend overnight because it just make things easier (and less daunting) if you break the cake up into two days, but an hour and half will do too. After the cake is well chilled, it’s time to finish the caramel and make this cake GORGEOUS. All you are doing is boiling that same caramel from earlier (that I left in the pot) and bringing it to a slightly high temp. It REALLY helps if you have a candy thermometer for this. It just takes the guessing out and makes things a little simpler. It’s not a must, but you know your caramel is ready when you use the thermometer. Also, it is important to let the caramel cool slightly before pouring it over the cake. This will help the caramel thicken up and also prevent the cake from melting. It’s kind of annoying, but pretty important, so don’t skip it. And then just pour the caramel over the cake, dip the apples and garnish with some salt and peanuts. 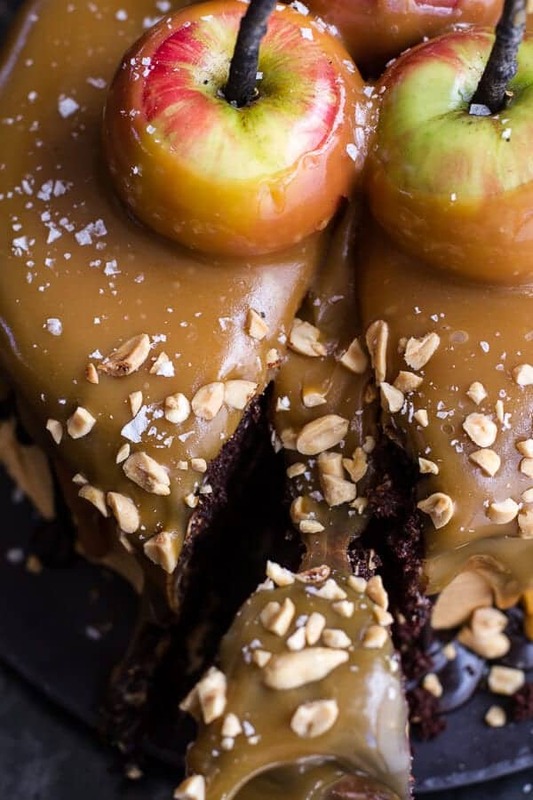 The caramel on the cake + apples should never become hard. It’s should firm up into a solid, but stay soft and chewy. Whew. I know. It’s a lot, but it’s fun and perfect for Halloween. Please don’t be freaked by the amount of time required here. It’s not a hard cake to make, it just needs a little time. And come on, how could it not be worth it?? Words cannot describe just how good this cake is. It’s so good that I wasn’t even complaining that I had to make it twice… in a two-day period. And yes, all the cake somehow managed to get eaten. Everyone from my family, to builders to friends, to random walk-ins loved this cake. What can I say, it’s just a lovable cake. Sorry for the giant post with too many words and WAY too many photos, but I am obviously pretty excited about this cake. 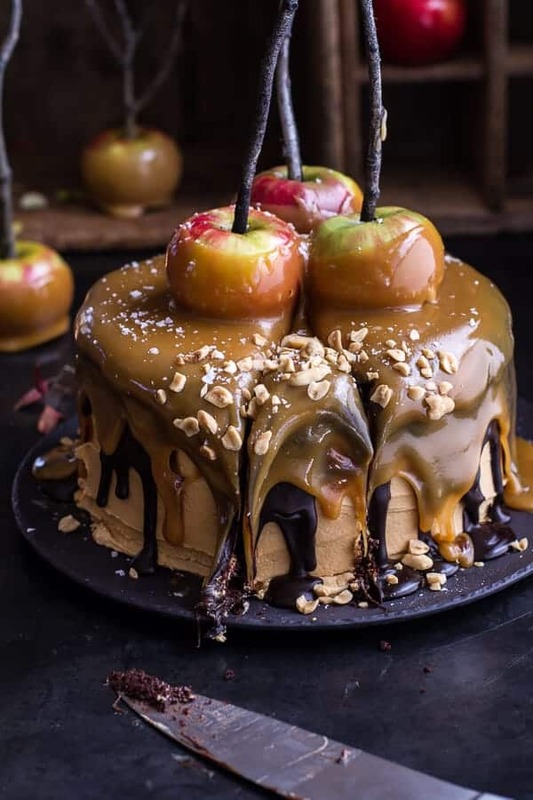 It has a little spook factor to it, the caramel apples and the whole Snickers thing makes it a dead ringer for Halloween, when everything is all about candy. Although, I didn't actually use any Snickers in this cake, it's just Snickers flavored.... but it's better than a Snickers. Preheat the oven to 350 degrees F. Grease three 8-inch (or 9 inch) round cake pans. Line with parchment paper, then butter/spray with cooking spray. In a medium size bowl combine the flour, sugar, unsweetened cocoa powder, baking soda, baking powder, cinnamon, allspice and salt. Set aside. In the bowl of a stand mixer (or use a hand held mixer) beat together the eggs, canola oil, apple sauce, and vanilla until smooth. Slowly add the dry ingredients to the wet ingredients with the mixer on low until there are no longer any clumps of flour. Add the hot coffee and mix until combined. Batter should be pourable, but not super thin. Pour the batter among the 3 cake pans and bake 20 to 25 minutes, until the tops are just set and no longer wiggly in the center. Remove and let cool five minutes, then run a knife around the edges of the pan. Grab 3 large flat plates, line them with wax or parchment paper and invert the cakes onto the paper lined plates. Cover and let the cakes cool completely before frosting. Place sugar, honey and apple cider in a large saucepan. Bring to a boil, boil, without stirring, 9 minutes or until light golden in color. Add the heavy cream, butter and vanilla, slowly stirring into pan. Boil for 10-15 minutes or until a candy thermometer reads 210 degrees F., stirring frequently. Remove the sauce from heat and add the salt. Using a heat proof measuring cup scoop out 1 cup of caramel sauce and allow it to cool. Cover the remaining sauce and set aside until the cake is ready (I just covered my pot and set it aside overnight). Now make the frosting, add the butter, cream cheese and powdered sugar to the bowl of stand mixer (or use a hand held mixer). Beat together until the butter is light and fluffy, about 4 minutes. Add the peanut butter, 1/3 cup of the cooled caramel sauce and the vanilla, beat, scraping down the sides as needed, another 2 minutes or until there are no streaks. Stir in the chopped peanuts. Place 1 layer of cake, flat side up, on a plate or cake stand. Drizzle the cake with a little salted caramel sauce (from the reserved 1 cup, not from the pot of caramel). With a knife or offset spatula, spread the top with frosting. Place the second layer on top, rounded side up, and drizzle with caramel. Spread the frosting evenly on the top. Add the final layer of cake and drizzle with the remaining caramel. Frost the top and sides of the cake. Don't worry about it being too perfect as you will be covering most of it up. Place the cake in fridge. To make the chocolate coating. In a microwave safe bowl add the chocolate and cream. Microwave on high for 30 second intervals, stirring between each until melted. Allow the sauce to cool 3-5 minutes, and then pour the sauce onto the middle of the cake and spread to just the sides, allow the sauce to drip down the sides of the cake. Place the cake in the fridge preferably overnight, but at least 1 1/2 hours. You need the chocolate to be completely set and the frosting firm. Once the cake is cool, grab that reserved caramel sauce in the pot. Place it back over medium-high heat and bring it to a boil. Boil for 15-20 minutes or until a candy thermometer reads between 220-230 degrees F (I let mine go to 225 and it was perfect). Remove the sauce from the stove and let is cool 15-20 minutes, stirring every so often. Make sure the caramel does not become too stiff. If it stiffens too much you will not be able to dip the apples. While the sauce cools, push the twigs or wooden sticks into the top of the apples. Line a baking sheet with wax paper. When the caramel has cooled (it should be a little thicker now, but still pourable), pour about half the caramel over the cake and allow it to fall down the sides of the cake. Working quickly, dip the apples into the remaining caramel and place the in the center of cake. Sprinkle the cake with flakey salt and peanuts. Make room in the fridge for the cake and refrigerate until firm, at least 30 minutes. The caramel should never get completely hard, but should be more of a soft firm. Once the caramel is firm, store the cake in the fridge until ready to serve. Allow the cake to sit 15 minutes at room temp before serving. Please not that this is a delicate and with all the toppings it is a bit tricky to slice. Your slices will not be perfect. Seriously? I cannot even handle it. This cake, I love this cake! So please make it – please! 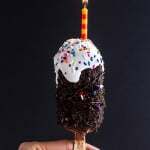 5-Ingredient Caramel Double Chocolate Birthday Ice Cream Cake Bars on a Stick. 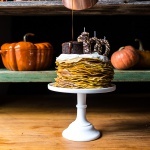 Pumpkin Nutella Crepe Cake…the 100th Year Celebration Cake!! This cake freakin’ blew me away. *KERPLUNK!! * (sound of my head hitting the floor) This is OMG TOTALLY OVER-THE-TOP INCREDIBLE!! (All caps are definitely mandatory here!) Positively swooning over that ooey gooey chocolate and caramel goodness! Love this cake – but I’m not a big bourbon lover. I’m making it this week for Tgiving… any substitution I should make for the liquor? If you can, sub apple cider. That will work best, but water will also work. Hope you love the cake and please let me know if you have any other questions. Oh. My. God. I love you. And this cake. I love you for making and sharing this cake. The pictures. Gosh, amazing. I have no words left for this other than Nitwit! Blubber! Oddment! Tweak! Thanks so much for all the kind words, Nora!! Have a great fall weekend! That gif of the caramel being poured is just too much to take on a Friday morning sat behind a desk!! Chocolate spice cake sounds amazing. The frosting sounds definitely worthy of eating it by the spoonful. I am excited for this cake too. It is a work of tasty art. When I saw this in my inbox, I had a moment of just ‘staring.’ Could not move my eyes off the screen! Holy moly! I’m making this. And I freakin can’t wait! Thank you Tieghan! I love you. Holy cow. This cake. It is probably the most gorgeous cake I have seen! Holy moly. This cake is insane! Love that you topped it with caramel apples! So fun and festive. Thank Laura! Have a fun fall weekend! Cakes are supposed to be over the top…ok maybe not always. But I have about 3 jars of salted caramel so this sounds perfect for me. Carried away in the best way possible!!! HOLY shiiiiiiiiiiit! whoa whoa and whoa! drooling over here!!! This cake is a hot caramel mess, and I LOVE it! I’m still trying to process all of the yummy drippy things on top, much less the insane flavor combo going on underneath. Now all that’s left is to plan my entire weekend on making this cake. I bow down to the master!! These photos and this whole concept, AMAZING!! Haha! Thanks Sophia! Hope you have a great weekend! If this is what happens when you get carried away, then keep getting carried, girl! This is one totally brilliant and amazing cake! Seriously stunning. Haha! Thank you so much, Kelli!! Have a great fall weekend! 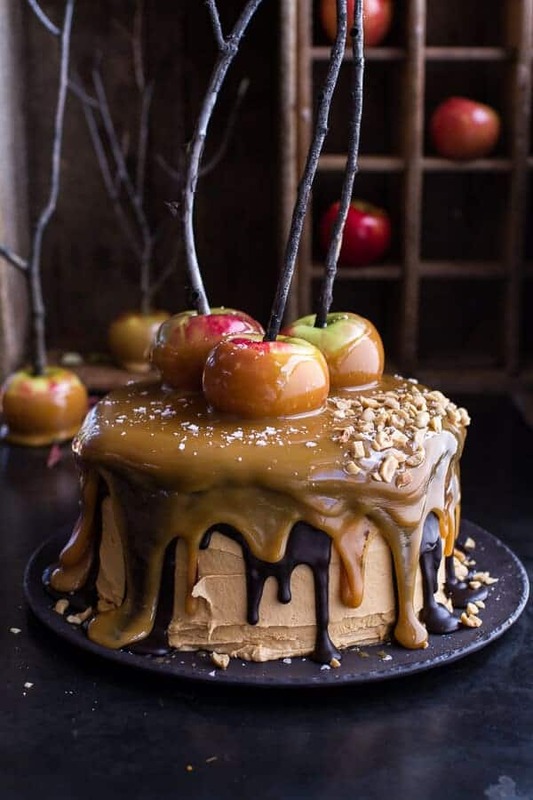 This cake is gorgeous…the apples and caramel…love it…some of your best photos and pour shots..awesome. I want a piece of this now…it looks so yummy. This cake is everything. Salty, chocolaty, peanut buttery, and with apples to make it healthy. Right? Right. Thanks Sarah and have a great weekend! This cake has such a “Snow White” feel to it! GORGEOUS! I bet it tasted fantastic, too! Thanks Lisa!! Have a great weekend! You can totally make this, trust me!! It’s supposed to be a messy cake anyway. Just DO NOT rush making this cake. Take your time with it, make it over two days and go slow. Let me know if you have any questions. Holy smokes – this is crazy, over the top indeed! WOW… you out did yourself here and I love it. Crazy festival, looks delicious. Thank you so much, Kevin!! Have a great weekend! Thanks Nicole! Have a great weekend! I am in complete awe! Simply amazing! Thank you so much, Sommer! Hope you have a great weekend! Oh my gosh–these are wonderful pictures! That last one looks like you could pick up the fork and start eating! The cake and the pictures look like they belong straight in Snow White. If i were Snow White, I would have not thought twice about taking a bite of the apple if it looked anything like this! Fantastic photos, and amazing job on the cake. wow! this cake looks too delicious to be true!! Is this even real? Looks amazing, can’t believe how appetizing this looks…. Oh my GOD this cake looks wickedly delicious Tieghan. Words cannot describe how badly I am craving a slice right now.. your baking skills are seriously incredible! Thank you so much, Thalia! Have a great weekend! This is the first time I have been on your site and I absolutely think you have the best food photos. And this cake, Wow! Oh wow! THANK YOU! I am so happy you like my photos, that makes my night! Hope you enjoy the recipes too and have a great weekend! i love the clever way you decorated it with the apples. very nice! This is beyond over the top. It stopped me in my tracks, and I had to come by for a closer look. Really, you’ve outdone yourself. Thank you so much, Katie! I hope you have a fun weekend fall weekend! Ugh, so sorry. I meant to say that I hope you have a fun fall weekend!! My brain…clearly it is friday night. OVER THE TOP!!!! GORGEOUS and I would definitely want to eat the whole thing! Did you try to put it in the refrigerator? When i made my last cake with caramel, it started melting in the fridge… and since i was making it ahead of time for the party, i was unpleasantly surprised. 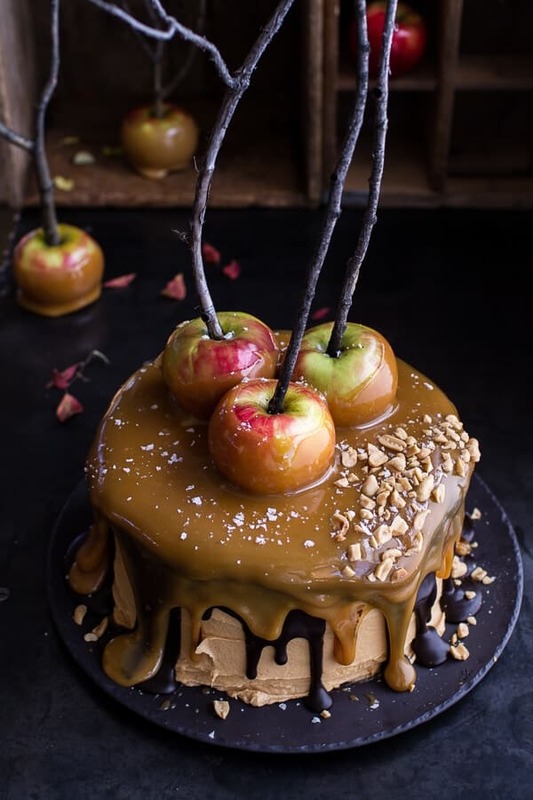 This looks AMAZING, love the whole caramel apple and stick composition, it looks perfect for Fall and Halloween. Would love to make this for another party, but don’t want melting again to happen.. It melted in the fridge? That seems odd. Mine did fine in the fridge, but I do prefer this left at room temp. It keeps great either way though. I would recommend trying out the caramel ahead of time first though. Sometimes caramels can be tricky. You have to get the timing just right. Please let me know if you have anymore questions. Hope you love the cake! This cake looks absolutely to die for! Hopping you have a fun fall weekend! I died and went to heaven when I saw this. 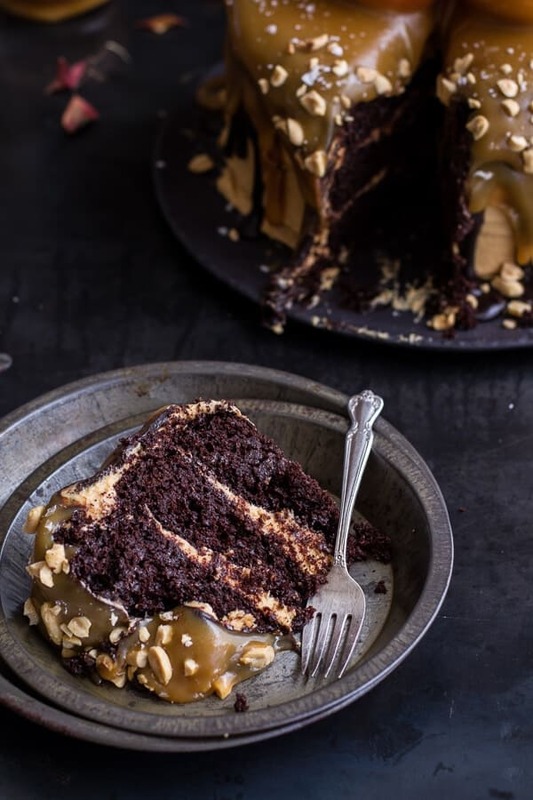 Snickers are my guilty treat and this cake with that caramel is perfection! Snickers, especially the homemade variety are the best!! Thanks Nik! Have a great weekend! This cake looks unreal, you are my hero!!! Love the caramel apples on top – totally over the top, and I love it! Thank you so much, Laura! Hope you are having a great weekend! Exquisite creation! I adore the plates. Could you please share where you got them? Thank you!! My dad found me the plates at an antique shop in CO. Which did you use,coffee or cider ?-I love both,which is better?-Since it has applesauce &cocoa,I can’t decide!-Thanks D.
I used and like coffee the best! Hope you love this cake! One word: obsessed. You’re a genius. Oh my goodness, this is an insane cake! It looks SO good. I’m planning to make this, but will have to travel with it (about 6 hours). Is that possible or will it be a disaster? Also, if I’m only going to do 2 layers, would I just reduce it by 1/3? I’m so looking forward to make this cake! Honestly, I am not sure. When I left my cake out in my warm kitchen, the frosting literally melted off the cake, but when I kept in a cool dark room it was fine. If you can keep it cool than I think you are fine. Also, is it possible to added the caramel layer once you arrive at your destination? Yes, just reduce the recipe by a 1/3. Please let me know if you have any questions. I want this cake to turn out great for you! Adding the caramel later already crossed my mind – that sounds like it may be best. So would I prepare it at home and then heat and add it when I get where I’m going? Thank you so much for your help! Yes, that is what I would do. I cannot be certain how it will go since I have not tried it out though. I would recommend doing a test run if you can. Maybe with just the caramel at least? Let me know if you have any questions! That’s definitely what I’ll do. One more question: I’m attempting to veganize this (I know, I’m crazy, but it looks so good). Will coconut milk work as a substitute for the heavy cream? OMG! Now way, please let me know how it goes and yes, coconut milk works great! Use canned full fat though. Hi! This looks SOOO amazing! I definitely want to try my hand at baking it. However, my family has a peanut allergy–is there an alternative you could suggest? Is there maybe a different frosting that would work well? I would use almond, pistachio or cashew butter. If you cannot use any nut butter, just leave it out completely. You may need a little more powdered sugar to stiffen it up a bit. Let me know if you have anymore questions. Hope you love this cake! I am also pretty excited about this cake! Spiced apple? Salted caramel? Chocolate? Nuts?! I can’t get over it. 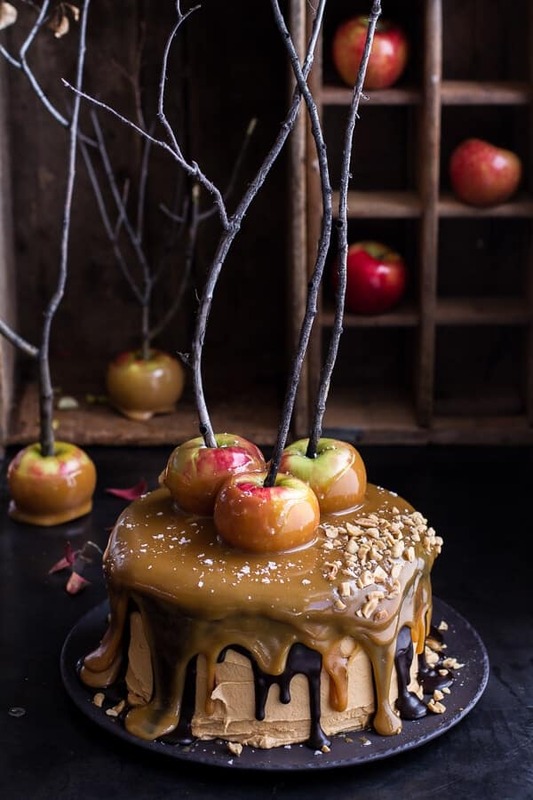 Those spooky twigs for the caramel apples are just the perfect touch! Oh my god! This cake simply looks amazing. Perfect for fall. And for some weird reason reminds me of Snow White. I love all the ingredients. But the idea of making a cake this amazing is a bit daunting. lol. Thanks for posting it! Your photos are so gorgeous that I want to make this cake immediately! It’s a perfect fall call – thank you for sharing this recipe with us! Oh my goodness. I feel like as a food blogger, I see sooo many baked goods that being SUPER impressed is sorta rare. But I’m literally so jaw-droppingly impressed at this cake, and your creativity, and GORGEOUUUS photography (those GIFs!). It’s just all kinds of wonderful. You’re super talented, just thought I’d be another person to tell you so 🙂 and I need to try this cake, stat. Pinned!! I’m obviously not the first to tell you this cake looks amazing! Did you make the apple “stick” decorations? I am obsessed with your recipes! Each one is more stunning and drool-worthy than the last. Seriously impressive. Thank you so much for the kind words! Hope you had a great weekend! Thats the most amazing cake I’ve ever seen. You win at cake. OH my goodness this is too incredible for words. So, so amazing, Tieghan!! Hi, I absolutely will be trying this cake for a fall party this weekend!! Do you think the cake will survive a 1 hr drive in the car to the party destination?? I plan to transport in a box so that it wouldn’t shift. Thanks!!! Honestly, I am not sure. When I left my cake out in my warm kitchen, the frosting literally melted off the cake, but when I kept in a cool dark room it was fine. If you can keep it cool than I think you are fine. My best advice is to keep the cake well chilled until you are ready. It should hold up fine for an hour in a cool, dark place. Please let me know if you have anymore questions and I hope the cake goes over great! Unbelievable. I can’t wait to make this someday soon! Jaw dropping photos. You always nail it. Ohhhhh my gosh!!! This cake is so unbelievable!!! I would like to jump into it directly!!! My veganized version of this cake has been an absolute hit! We’ve been eating it for breakfast AND dessert and it made the 7 hour drive! Thank you so much for all of your help in answering my questions! SO excited you loved this and your vegan version killed it!! it you have a pic, tag me on Instagram I would love to see it! Hi Tieghan, this is a lovely recipe and I absolutely love the decor. I was wondering, where you got the twigs/sticks to put in the apples? Wow that looks like heaven, gotta give this a go. Thanks for posting this. The cake looks so good and that caramel is a caramel lovers dream. Yum Yum! I love this cake!! I’m going to make this for Thanksgiving!! What brand of peanut butter did you use?? TAHNK YOU! Have you tried it yet? I used Jif natural peanut butter. I just came across your beautiful blog on Pinterest. This cake is a spectacular piece of work! Ok… WHERE did that measuring cup come from? Too cute! A new reader here–loving the blog! Thank you SO much! The measuring cup is from west elm. Can’t wait to make it!Since I live in Greece I don’t think I will be able to find canned apple sauce,do you have a recipe in order to make my own? Hi!! I do not have one on the blog, but here is one I have used. Let me know if you have any other questions and I hope you love the cake! Okay so I totally want to make this cake for Thanksgiving.. My only concern is travel, if the cake is out for too long will it start to melt everywhere or do you think it will be okay? Hey Lauren, the cake should be kept out of the sun and in a cool place. The cake I left out did start to slump after a day, but the cake kept in the fridge and then take out 30 minutes prior to serving stayed nice and tall. How long will you be traveling? I love caramel, and I cannot wait to try this recipe. (All the recipes, actually. I’m deciding how to eat my way through your blog!) I really want to try this cake, but I am very allergic to peanut everything. Do you think I could use soy butter or something of similar consistency? Thanks! Hey Meagan, I think any nut butter would work great. I have never tried soy butter, but if it is similar to the consistency of peanut butter and you like it, I would go for it! Hope you love this and please let me know if you have any questions. Why does the recipe call for 6 twigs when you have 3 apples? I’m not doing extra apples. What am I missing? Hi, sorry that is a mistake on my part. I will fix the recipe. Enjoy the cake! I am making this cake for Thanksgiving, I am having a horrible time getting the caramel to thicken. I have made caramel before and have not had this problem. I used 1/2 bourbon and 1/2 apple juice. I cannot figure out what I am doing wrong. I am on my second batch and the same thing happened. It taste great…..I even added corn starch as suggested on line. Any suggestions? Cake layers came out perfect! Hey Brenda! I am so sorry you are having trouble with the caramel. Have you tried boiling it longer and then allowing it so cool and thicken?? Caramel is so tricky and it seems to work for some an not others. I had the same problem, but I just kept adding a little sugar to the sauce, just a tablespoon or two at a time, and I let it boil for a really long time. If you end up starting over, maybe cut down the cream just a little bit (by 1/4 – 1/2 cup or so). You can always add it if it’s looking too thick. That worked for me!! Such a great tip! Thank you for sharing!! Hey Sam! There are actually no chocolate chunks in the batter. Hope you love cake! Hi, I will definitely be following you after seeing this mastermind cake! 🙂 Amazing and I’m excited to try it out! Question: what bourbon do you use? I’ve never cooked or used bourbon before, so this is new to me. Also, what coffee brand did you use as well? You take such beautiful food photographs! I’m a (new!) fan! I am in the process of making this cake. So far…the everything is turning out great! Planning on letting it set up overnight, then finishing tomorrow for Turkey Day. 🙂 My question is, how cool does the caramel need to be before pouring it over the cake at the end? I’m worried about melting the chocolate when I pour it on. I like the caramel at room temp, but it can still be a tad warm without melting the chocolate. Happy Thanksgiving!!! Hi there. I’m making this for Thanksgiving and wondering if the first batch of caramel (the one cooked to 210) should be a little runny still? I’ve never made caramel so I’m not sure if it is supposed to be thick already, or if it will get to the consistency in your gif at 230 degrees. I do have to say that everything I have tasted along the way has been delicious and I cannot wait to taste the finished product. Amazing recipe! Hey Ryan! Yup, the first caramel should be a little runny. You are on the right rack! Let me know if you have any questions, hope you love the cake! My first time making some things turn out to be challenges. I messed up the first batch of caramel, tried to ice the cake with icing that was too warm, and spilled my first batch of ganache all over my counter top. That being said, all of that meant nothing after finishing the cake! It was really, really good, and everyone loved it so much that I was volunteered to bring it to a Christmas gathering. I have a question about changing it up a little bit too. I’m not a huge peanut butter and peanut fan, so could I make an apple cinnamon flavored icing instead to go more along with the salted caramel apple theme? Hey Ryan!! UGH. So sorry you had some challenges, but so happy the cake turned out great! Yes, you can most definitely switch up the frosting to whatever you want. The apple cinnamon flavor sounds awesome. Thanks so much and let me know if you have any more questions. Hi! Saw this cake on tumblr and thought it looked amazing, so I made it for Thanksgiving. Everything was going great until it was time to do the final layer of caramel. I don’t have a candy thermometer so I had to guess, and I think I boiled it for too long because it ended up being too stiff. I poured it anyway and it might be too hard to cut, but at least the cake looks fantastic! I can’t wait to see how the finished product tastes tomorrow. Thanks for the recipe! This looks outrages!! This cake replaces “all” other fabulous baking creations; man, this is a “wow” cake. Wonderful, thank you for sharing I will most definitely like to bake this prize winner. Have a grateful day. Thank you for creating this symphony of deliciousness! I made this for thanksgiving dinner and despite some minor hiccups(i.e making caramel-which I’ve always been horrible at, and trying to ice with too warm icing) I was able to tweak it to this amazing duplicate of your creativity! Lots of OOOooos and AHHhhs! Happy Holidays! THANK YOOU! So happy you nailed the cake and happy belated Thanksgiving! I made this cake for Thanksgiving. Not only was it impressive looking, but it tasted amazing. I was expecting it to be too sweet and rich, but it wasn’t. Next weekend I’m making some salted caramel brownies to use up the rest of my caramel. If it isn’t gone by that point, I’ll just eat it with a spoon. Thank you for posting this! love the post! where did you get your awesome measuring cup? Thank you so much! I got them at West Elm a while back. Gosh, this cake is a friggen piece of art. OMG I can’t even…. I think I overstarred at it hahaha. And now I have an unbearable desire to drop it all and go and make this cake RIGHT NOW! Cake is good but ran into issues with the caramel sauce. It was way too runny so in future use only 3/4 cup of cream and 4 tbsp of butter, cut sugar to 1 cup, and only 1/2 cup cider OR bourbon since with the cream this adds too much liquid to the sauce and not enough distinct flavor to warrant an extra cup of both. The caramel sauce was so runny I had to start again as no matter what it did not thicken. Looking at similar sauce recipes online told me that cutting the liquids made perfect sense and there was still enough for the whole cake. For the frosting I cut out the butter completely (I never use butter in my frostings) used a whole 8oz brick of cream cheese, 3/4 cup of peanut butter. You state in the recipe for making the caramel sauce to boil it for 10 to 15 mins. or until it reaches 210 degrees F. The boiling point of any substance is 212 degrees F. I’m am making right now and going to follow the time instead of the temperature. I hope it works out, but it would like to know what the temp should be. hey Laura, It should be around 210 degrees F. if it is a littler higher or lower that is ok. I made an error in my question about the boiling point of liquids. Sorry I think I got it. This recipe looks amazing. I finally found an occasion to make this cake: my boyfriend’s birthday! However, I do not have a ton of time at night, so I want to break the recipe into steps, and I plan on traveling with this cake for a couple of hours in the car. My plan: I was going to make the cake layers first, and then freeze them until I am ready to cover them with frosting. I was also going to make the caramel separately and then reheat it when I get to the place I am going and pour it over the cake. Let me know if you think this is okay. I have never made caramel before so I am a bit nervous. I think this is a good plan, but if you have never made caramel, I would try making that first so you know the recipe will work perfect for you. This will give you time to ask question and or adjust if needed. Let me know if you have any questions at all and I will try and answer them right away. Hope you love this cake! I’ve made your Snickers frosting twice now and wow so very good! I mean good like we eat every bite out of the bowl before putting it in the sink! I’ve made it with an apple and chocolate layered cake and then most recently with a chocolate stout cake. I layer with ganache and caramel and people LOVE it. It has brought so much joy and excitement when I serve it, thank you! SO HAPPY you loved it!! Thank you!!! This looks great. But it’s really hot where I am so I was wondering about a few things: 1. The frosting: is it very soft and doesn’t hold well? Does it “leak”/separate easily? 2. We don’t get apple cider here, would apple juice (freshly squeezed in a juicer/juice extractor) work? 3. I have 3 9” pans but they’re quite shallow. Is this cake one of those that rise by loads? So should I use deeper ones? 4. Is the texture of the cake fairly dense because I don’t think I’ll get lightweight apples and don’t want it all sinking and caving in. 5. I need to transport it for an hour and it’s 30°C weather. Do you recommend making this over 3 days? Or will it dry out too much? Does it taste better as it stands? Would have liked to make cakes on one day, do frosting, caramel and ganache on next, and then final caramel and transportation on the last to give enough chill time between all the steps? I live in Hong Kong and I am so glad I came across your blog. My boyfriend saw this cake and had a huge smile on his face. No doubt he wants it for his birthday. Your recipes are mouth watering and I find myself wasting (no, no, usefully spending) hours on your blog. I have been baking for a few years now. I think what you do is brilliant. You should open up a restaurant. And if you do, I’ll fly down to try all your yummy dishes! Hey, what are your reccomendations about making this cake in advance? im thinking about making it for my birthday but the day before. Would it dry out or what? No, that would be great! Just keep the cake in the fridge and it will be great! Hope you love this and HAPPY BIRTHDAY!! Okay. So I made this cake. And it smelled/looked amazing… for the most part. But I kinda mucked it up at the last minute. I accidentally added too much caramel (which overflowed all over the cake) but managed to refrigerate it immediately – so that was fine. But then I covered the cake (which I thought wasn’t touching the cake) with a steel bowl & plate. But then this morning I found out it was. I tried to lift off the cover and half of the topping came off with it! I tried to salvage it but now half of the cake looks like a puzzle. I don’t know about the time difference but any pointers will help! I have about a half cup of caramel left in the fridge, should I just try and pour it on the broken pieces of hardened chocolate and caramel that have been assembled on top of half the cake? Ahhh. I feel so silly. I wish I could get it right on the first try always. The best part is (note the sarcasm) this is a cake for a birthday tonight. Everything went well except when i was preparing the caramel sauce for pouring onto the cake, i wouldn’t thicken at all. How could i fix that? This is the most eye-catching cake I have ever seen. The pictures are amazing and the description makes me melt! Thank you for sharing this creative recipe. I don’t use liquor and we don’t have apple cider here. So for the caramel sauce, what should I replace the bourbon and apple cider with? Just use water, that will work great. Hope you love this cake! Oh my… this is really decadent! HI!! I have persanly never tried making a rectangle cake, but I think that making this in two 9×14 inch pans would be fine, but the baking times will be just a little different, so be sure to check for doneness before you take them out of them oven. It is best to make the cake 1-2 days in advance so it has time to stiffen and chill in the fridge, other wise the caramel makes the cake very unsturdy. You can use 1 cup apple cider or just 1 cup water. Please let me know if you have any other questions, I hope the cake turns out great for you!! Thank you for your help. All turned out fantastic. The cake was a huge success. Think it will be the talk of the party. I am just now seeing this and I guess it would be a great Halloween cake but it would make a great fall centerpiece dessert. Hi, I have been wanting to this cake since I first saw the photos last Fall. I do have a question though. In the last set of instructions under ‘To Finish’, the last line in the first paragraph says to “line a baking sheet with wax paper’. What is this step for? Hey Gina, that is a typo. Sorry! Hope you love the cake! I think I’d like to try this for Thanksgiving this year (Which is in October in Canada, so still in time for the whole candy theme ;D ) the thing is … my husband absolutely won’t have anything to do with apples. 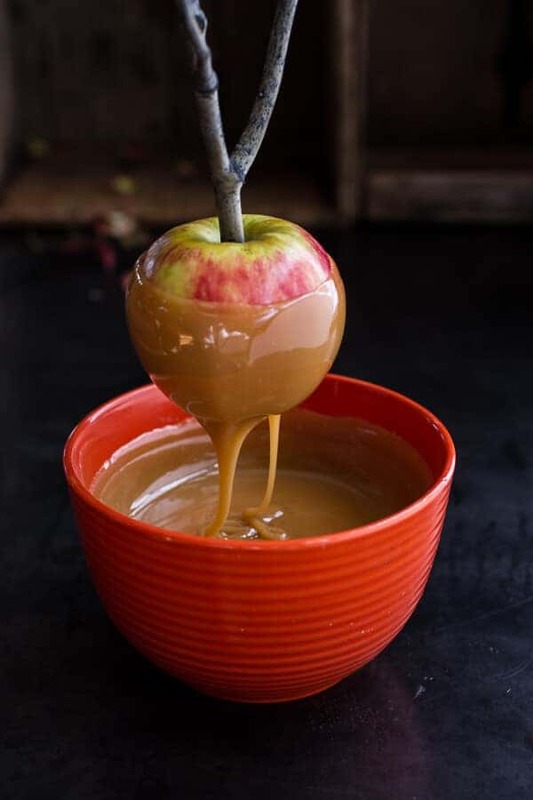 Obviously I’ll leave off the caramel apple decorations, but what can I use to substitute the apple sauce? Sadly, I love him too much to lie to him about. Hi!! You can replace the apple sauce with buttermilk. Hope you all love the cake!! Sorry, but what is “heavy cream”? I’m from Latvia and i don’t what this mean. Okay so I have never responded on a food blog before….but after making this cake last night I had to!! This cake wasn’t an easy one, and somewhat pricey but the most fun cake I’ve ever baked and definitely worth the effort! Every layer has amazing flavor and texture…what an unusual combination…you have a gift! Who would have thought to combine chocolate, applesauce, coffee and allspice! Kudos to you girl….this will be a family favorite and I so appreciate you taking the time and the effort on this one!! YAY! Let me know how it goes! THANK YOU! This may be a stupid question. But how hard would this be to turn into cupcakes? Not stupid and not too hard. Just make the cake into around 32 cupcakes. Thank pokes holes in the cupcakes and drizzle with caramel. 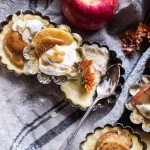 Add the frosting and if you have them, tiny caramel apples and sliced apple wedges dipped in caramel. Does that help? Thank you for this post! I am on my second round of caramel but going it goes better this time. A note about the caramel though, I didn’t realize I was almost out of vanilla and when it came time to add it to the caramel, I ran out! I substituted almond extract and it add such a unique flavor that I may do it on purpose this time. Can wait to try this! I am making mine in smaller cake pans so I can share the love with a few friends who decided I needed to make this. Thanks again! Hope you enjoyed the cakes! I saw in a magazine where they used granny smith apples (they won’t darken) and a melon baller to make tiny apples. Perhaps not as cute as whole apples, but will not be as heavy. I love the twigs as sticks. did you clean them a special way before putting them in apple? I cannot wait to make this cake! I am in the process of making this beautiful cake. It is time consuming as I started yesterday afternoon and just now putting the chocolate ganache on to make sure it all stayed together. I had a problem with the assembly of cake to caramel to frosting though. It was not possible to use 1 cup of caramel over the layers of cake as it just dripped right off and then it was impossible to frost immediately after the caramel was too wet to spread the frosting. I ended up getting as much as I could between layers and refrigerated the cake to get cold and then was able to frost the remainder of the cake. I’m not sure what I did wrong or should do differently next time. Oh yes! If this taste half as amazing as it it looks – there will be a next time! You actually did everything correct and just the way I made my cake. I also placed my cake in the fridge after adding the caramel. I will say you may not have needed to add the full cup of caramel if you felt like it was a bit too much. I would do everything the same next time, maybe just a little less caramel if desired. Hope the cake is a HUGE it! TAHNK YOU! Hi there – my husband is gluten intolerant, and I was wondering if you know which gluten-free flour (such as corn/buckwheat/tapioca) would work best for this recipe? I really want to give it a go for our Halloween party, but with his recent celiac diagnosis, finding the right mix of flour can be hit/miss. Thanks! PS: FREAKING GORGEOUS CAKE. I am not gluten free, so I really do not know. I would use whatever you typically have success with. Sorry I could not help more! Mine would have looked better if I let my caramel cool a little longer. I admit, I got impatient. It still tasted amazingly good. All I have to say is WOW. I made this cake and everyone who had it loved it. I tastes like you are eating the best snickers bar ever. It is definitely a once or twice a year treat because of how rich and time consuming it is, but well worth it. SO happy you love the cake! THANK YOU! Soooo beautiful! I’m in love with your measuring cup! Who makes it? Hi Laura, what is is that you do not understand? The measurements? You need about 10 ounces of coffee. This cake looked amazing and I decided I wanted to make it for my 40th birthday! I’m in the process of making it now (waiting for cakes to cool a bit more and frosting to stiffen a bit), but had some issues with the caramel cooking way too quickly. I let it boil for the 9 minutes then added the cream/butter/etc, but thought I had to boil for another 10-15 on top of that. I only got to 4 minutes before it started to burn a bit, and when I added the candy thermometer it went to 230 degrees! I guess it was only supposed to be cooked for an additional 3-6 after that first 9 minutes? Or I should have turned the heat down? I also had trouble with the caramel hardening too much while I put the rest of the frosting together and it was like taffy consistency when I tried to add it (microwaving didn’t help). I made do with some salted caramel flavored syrup and squeezable caramel topping and am hopping I’ll be able to get the rest of it to liquidify again tomorrow to cover the cake. Planning to use the double boiler method as I had to get it out of the burned saucepan already. If not, maybe I’ll have to make a new batch of caramel all together when I’m ready to pour it. After the 9 minutes, I added the cream/butter etc. but it only took 3-4 more minutes after that to get up to 230 degrees. No matter though, I worked it out and everyone enjoyed it! Posted a link to a picture in a comment down thread. Thanks! Hmm! Wow! You caramel must have just cooked really fast. Happy it turned out well! THANKS! Just made this for a little girls’ birthday Halloween extravaganza in cupcake form (Minus the bourbon of course) I had so much fun and cannot wait to try the “real” thing in the coming weeks. They may be messy but they are super cute and perfectly sized for kids. I can’t wait to try this recipe this year with all of the Halloween festivities coming up! The chocolate cake and the caramel look so delicious! how long does this cake last in the fridge? Looks delicious, can’t wait to make it! What type of bourbon did you use? I’m going to attempt this cake next week so working on my grocery list! Love everything about this cake by the way! Have you used butter instead of canola oil in the cake mix before? I usually like to use butter in my recipes, but I do have a few that butter just won’t give the same result as oil when you make it. I want to try this but I don’t want to mess it up putting butter in if it won’t work well. I have not because I personally think canola oil works best for cakes, BUT if you like butter that will be fine. Enjoy the cake! Love this cake! Just made my 1st attempt and my caramel and frosting was way too thin and runny but it is frisked and in the frig. My guess is the caramel didn’t hit the mark…it is fairly humid here today so that could be the issue. When I was cooking the caramel I followed the directions to the tee. After adding the cream, butter etc my thermometer got to 210 within 5 minutes but I let it cook until 12 min (213). The frosting was just not fluffy and I think this was the caramel? Would it help to stick the reserve caramel in the frig before incorporating into the frosting? You mentioned putting caramel on the cake then refrigeration prior to frosting? Did you also put the frosting in the frig too? Thank you in advance for our advise as I want the to be my Thanksgiving Centerpiece! So I did not put the frosting in the fridge, but I did allow the caramel to cool before I added it to the frosting, did you do this? I am not %100 sure as to what exactly you did or are asking, but let me know what I can help with!! Hope we can get it just right for you! Thanks!! Thanks for the reply. I think I needed to let the caramel cool more prior to adding to the frosting! I made this cake for my family at our Halloween dinner. It was amazing. I can’t say enough about every flavor in each layer. The cake amazing, the frosting is one I will use on many cakes, the ganach perfect and the Carmel was best I ever made. Thank you for such an amazing recipe. It’s worth every step. Final cake in the frig. For my next attempt can you help me with..
* initially caramel too thin? Should I cool the caramel prior to putting in the frosting? As my initial caramel was too thin I boiled the 2nd caramel for the full 20 min reaching 225 degrees but it got too gooey. ..to try it as the flavors are amazing. Thank you for this amazing cake! Sugar COMA!!! No just kidding (well almost) – my daughter and I made this for our annual Halloween birthday dinner and HOLY COW we got the reactions we hoped for. When brought the cake to the table we were greeted with GASPS of pure delight. The cake looked exactly like you pictured on your blog (Divine) even down to the branches in the apples. This cake would easily fee 20 people since a small slice is all you can eat before landing in a sugar coma requiring an insulin intervention. It was a total success and the apples were also enjoyed that night too. One small glitch as I noted form another comment, my caramel never got thick either. I will try again and feel sure it was baker error and not recipe error. I opted for a can of salted caramel frosting I had on hand and it worked just fine in a pinch. Don’t worry – the other sauce made from the recipe will go great over coffee ice cream at a later date! I love your blog and also make the Autumn Pot Pie for this dinner too! What rave reviews I received for this birthday celebration. Thanks so much for your creative culinary skills! Do you have a VEGAN version of this recipe? HI Mike, I am sorry but I don’t. Why are there 6 twigs and 3 apples? What do I do with the other twigs? Sorry, that is a typo. You only need three twigs. Hope you love the cake! Made this cake for our “Ladies Night Out Halloween Dinner.” It was a HUGE hit! Everyone loved it. I used fake spiderwebs and a spider and draped it through the top of the twigs to make it more spooky! Fun cake thanks for the recipe! This cake is just simply WOW and I am hoping I can do it justice. I plan on making it for a Halloween party this Friday. I am going to start tomorrow! I am however a little worried about the caramel given the comments. So I wondered if I could cheat a little and use Kraft Caramels? 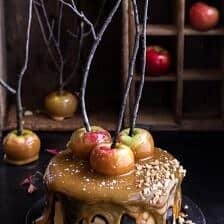 I have used them before for caramel apples but wondered if it would work here. Should I add some cream? Some bourbon? Any help would be greatly appreciated! Thanks for a super post! 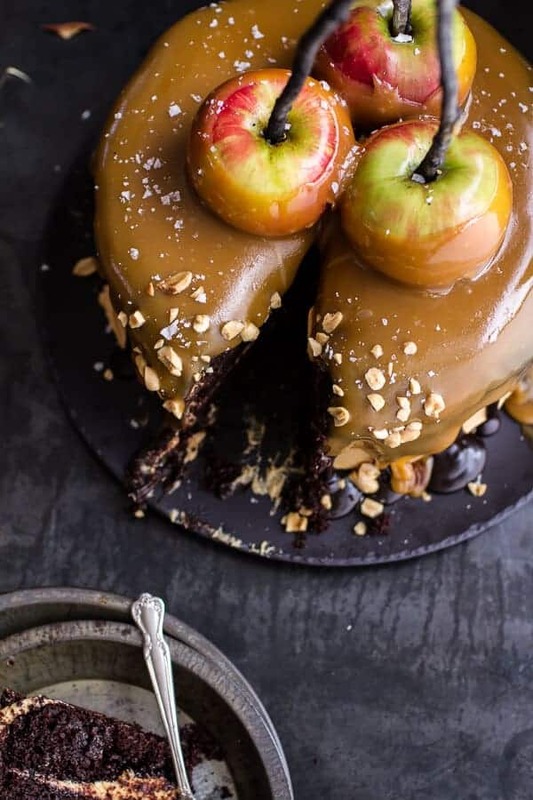 This cake is so beautiful and it looks dilicious, i wan’t to bake it for a kids halloweenparty but dont want to use alcohol so can i use appeljuice instead? compliments for your great cake!!! You can use cider in place of the bourbon, according to Teghan’s reply to Tracy on Nov. 23, 2014. The taste of bourbon does come through (nicely! ), so I’d recommend replacing it if serving to children. Apple juice or apple cider will both work great. Thanks! Hi, i thought i already sent this message but i can’t find it on here, so sorry if i actually have. For the salted caramel sauce it says 1 cup butter. Is this normal butter? As in salted? And does 1 cup mean softened butter like for the frosting? If it’s not softened how is it measured out? Yes, I did use salted butter and 1 cup equals 16 tablespoons, the butter can be cold or at room temp. make sense? Let me know if you have other questions. Thanks! I made this tonight, boy what a mess! The cake has such a good flavor though, so will keep the recipie on hand for future use. I’m sure my coworkers will gobble it up despite the poor presentation! Hi, I am in the process of making this amazing cake, and I was wondering if it is a very dense and shallow cake?? Almost like a Texas sheet cake? Thanks in advance! Hi Jackie! The cake is not dense, but it is REALLY moist. Hope you love the cake! I made this as cupcakes, and it was super delicious! Thanks for the recipe!! A few notes about cupcakes, in case anyone else wants to go this route. -I only wanted 12 cupcakes, so I only did 1/3 of the cake recipe, and it worked nicely. -I halved the frosting recipe, and it made just the right amount of frosting for the typical amount of frosting found on cupcakes. I think it was quite a generous amount for each. -I opted to not do any caramel apples, so I did only a 1/4th of the caramel recipe. Because of the reduced ingredients, the caramel cooked far faster than the recipe describes. I would greatly suggest using a candy thermometer to make sure you don’t overcook the caramel. I purely went by temperature instead of time, so it all worked out for me. (It’s amazingly delicious, btw!! It’s my new go to caramel recipe!). -For putting it all together, I followed advice from another comment and poked holes in the cupcakes, and then put a layer of the caramel on. Then, I put on the frosting, followed by the ganache. After that, I put on another layer of caramel and then the peanuts. -I have some advice about topping with caramel as well- It tends to run off of the cupcakes, and after sitting in the fridge for a while, I noticed most fell to the bottom of the container I had the cupcakes in. The liners were all soaked with it, too. I ended up just scooping it back up, but I would suggest waiting until serving to top with the final caramel and peanuts. This cake was the hit of the party last night ….thank you ! Wish I could post a picture ! Oh awesome! So happy the cake was a hit! THANK!! I made this cake a couple weeks ago for a fall cookout with friends. It was a huge hit! Not only did it look good, but it tasted sinfully delicious! I did not add the apples, but it still looked gorgeous! Oh that is awesome! So happy the cake was a hit! THANKS!! Wow! I made this cake for Halloween… So amazing. Such a talent you have, thanks for sharing it! Oh awesome! I am so happy it was a hit, THANK YOU! I made the caramel exactly to your instructions..it is so thin…will it thicken when it cools?? Hey Alicia, it should thicken as it cools. Hope you love this! I made the caramel sauce, but for some reason it is insanely thin and runny. How do I thicken it up? Everything else is amazing! You’re a pro! Hey Tara!! Just place it back on the stove and boil it for 10 minutes or until it seems thick enough. Not that the caramel will thicken as it cools. I made the cake and it was amazing!!! A bit messy but that seems to be just my way of cooking 😉 The link below takes you to my page where I have all the photos and a link to your recipe page!! Hope you take a look! Thanks for the fun recipe!! OMG!! It is perfect! So happy you loved it, thank you!! This looks so amazing- would you recommend making this the night before or morning of to bring for thanksgiving dinner? HI Colleen, make this the night before or even the two days before thanksgiving. It really needs time to chill in the fridge. Let me know of you have any other questions. Thanks! made this this last halloween. was a huge hit! and i felt so proud after completing it, especially with everyone raving about it the rest of the vacation. i added a little less cream after reading some people mention thin caramel. i also cooked it for longer both times, and kept it around 225F for a few minutes. it was still a little thin for apple dipping but that wasn’t on my agenda so it was perfect for over top the cake. I just finished Day 1 of making this cake and omg it is amazing but so much work. I think the frosting is literally one of the best things I’ve ever tasted. I hate to cover it up tomorrow! Anyway, I was just reading over the steps for finishing the cake tomorrow and have a question about how you balance putting the apples on the cake (with sticks) and then putting it in the refrigerator? I know my fridge doesn’t have room for those! I should say that I know my refrigerator won’t have room for the cake & apples WITH sticks in. Thanks! Honestly, I would just leave the stick off and then add them before serving if you really want the sticks in the cake. Let me know if you have other questions. THANKS! I ended up leaving the sticks off, but it all turned out so amazing! Absolutely delicious. Thank you so much for the recipe! OMG!! It looks amazing! Thank you! I’m attempting to make this cake and everything is turning out accept for the caramel sauce. It seems very thin. I let it set overnight too. Can I try boiling it longer to thicken or do I have to start over? Sorry for the trouble. Yes, just boil the sauce longer until you feel it looks right. That will solve the issue of the sauce being thin. Let me know if you have any other questions. Hope you love the cake! Thank you for this amazing recipe!!! I just completed it for my grandson’s 10th birthday party this evening and it looks fabulous–oh, my. Wish I could post a picture of it. Hello there!! I will be making this cake for thanksgiving!!! Thank you so much for sharing the recipe!!!! I am a little scared to attempt to caramel with all the comments i have seen, but i will give it a shot…..
Hi! I really want to make this cake. It looks amazing! I know this is silly because desset is dessert, but I’m afraid of it coming out too sweet. Is there anyway or reducing the sweetness of the cake batter without messing up the recipe? Or do you think it actually balances itself out and that won’t be necessary? So idk whats wrong with me but I cant find the measurements for the frosting with the cream cheese. Help! Please! It’s the last list of ingredients under the Snicker’s Frosting” tittle. Happy Thanksgiving! Made to this for Thanksgiving tomorrow, excited to taste it! A good note to readers, the second caramel thickens as it cools. Just be patient and it will look like the photos! Trust the process ! Hope it is a hit! Happy Thanksgiving!! My caramel is not getting thick and when it sits it’s separating. Not sure what I’ve done wrong… could it be that I just need to boil it longer? HI Samantha, I think you probably just need to let the caramel sit and cool longer. Maybe a few hours or overnight if possible. Sorry for the trouble! I made this for a Thanksgiving brunch and had a line of people salivating as I cut it! I made 1 1/2 times the recipe and used a 10 inch cake pan. I ended up using only two of the layers but then slicing them in half lengthwise so I had four shorter layers. I made double the peanut butter frosting. It was delicious!! Like others I found that the caramel thickened over time, I would suggest leaving it for much longer than the 15-20 min. You can always heat it back up if it gets too thick, but I don’t think it will. I’ve also got extra caramel sauce in a jar and can’t wait to use it! so happy it was a hit!! Thanks so much!! Happy holidays! Holy heaven! To be totally honest, those pictures make me want to take a sick day from work right now so I can go home and make this ASAP. Totally, completely divine! Oh wow. This cake looks unreal. What in goodness gracious. It must taste absolutely delicious. I was supposed to make this cake last year in the fall but it never happened. THIS TIME THOUGH I WILL. I’ll have to put it down in my Calendar for October. These are the most amazing cake pictures I have ever seen! I could just feel the salty caramel snickery chocolate taste while reading the post. Love that you have included apples and cinnamon as well! Always a good combination! Haha thanks so much Samantha!! Enjoy!? 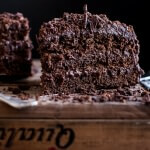 I have just discovered this blog…I have just discovered this cake…I think I have died…I am going to read the “bleep” out of your blog and make every darn thing here! You are certainly my inspiration! Haha I am SO SO happy you are loving my blog and recipes! It honestly puts a huge smile on my face hearing that. Thanks so much Julie, I hope you continue to enjoy!! This cake is amazing!! I made it in a bundt pan and sliced layers. Easy to cut!!! WOO! So happy you loved it and sounds amazing Cissy!! I think I just found my birthday cake for this year. I love having a birthday during apple season! I love having A birthday during apple season too!! Couldn’t be A better time!! Hope you love the cake Katie! Hello! I’ve made this amazing cake before and planned on making it again for a party- the only issue is someone had a nut allergy. Do you have any suggestions or alternatives for the frosting? Thank you! Hey Sarah! I think you can just omit the nuts. It should not be a big deal. Let me know if you have questions. Thanks! This is a beautiful cake. I definatley want to try it. My daughter loves caramel. have fun at Harry Potter World! Thank you Debbi! I hope you and your daughter love this cake! I have an apple themed dinner party I need to make dessert for. Would you say the apple comes through in this cake? I’m afraid it will be totally masked by he chocolate and peanut butter. But I really want an excuse to make it!! Hey Christina!! 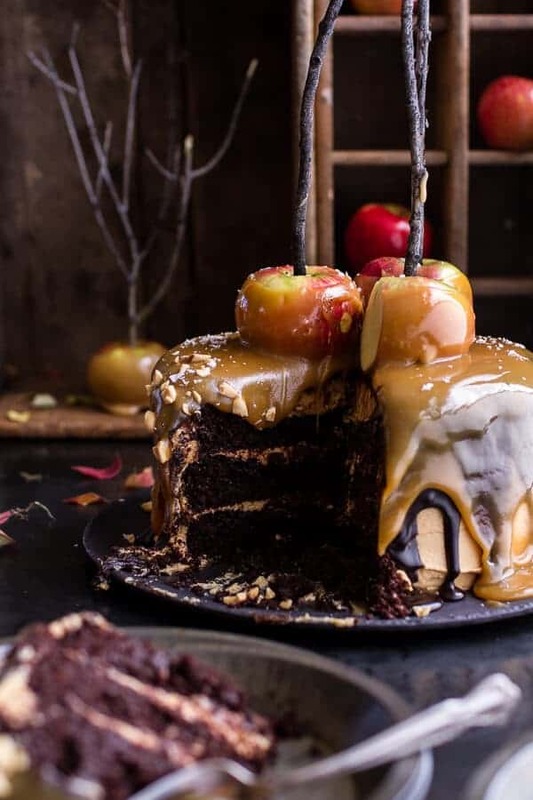 So the cake is very much chocolate and the apple flavor really only come through when you get a bite of the caramel apples. Too kind of up to you, but if you ask me, it counts as apple themed for sure! ? let me know if you have other questions. Thanks! what a beauty is this! I will try to make it for my grandma’s 90th birthday next Saturday. I am not used to work with Caramel so I hope it works out, but I love to have some baking challenge, so I am going to try it. I come from the Netherlands and I believe Apple cider is in the Netherlands not the same as in America and I don’t think I can find the American version. Do you think I can use Apple juice instead? This cake is INCREDIBLE. Pinned and waiting for Halloween to make it 😉 One question though. I was thinking about adding a bit of pumpkin to the cake, do you think it would work? Maybe 1/4 cup or so, not much, just so there’s a very faint pumpkin flavour? Do you think it would work? Do you think I should take out an ingredient of I decide to do that? God help me I’m making this right now/ I’m at the caramel stage…. That is awesome! I hope you love the cake, let me know if you have any questions!! Hi, I’m in the middle of making this cake & in the frosting ingredient list you have 1/2 c. Heavy cream but then don’t mention the cream in the frosting directions. Do I add the cream when mixing the frosting? Never mind! The cream is used with the bittersweet chocolate. Sorry, I missed that part! Haha super happy you got it! Thanks so much Melissa, I hope it turns out awesome! Let me knoe if you hav any other questions! One last question…my caramel seems “grainy”…do you think it might be the cider curdled the cream a little bit? I’ve made plain caramels before that were smoother…just wondering! I over worked my ganache so it’s quite thick but oh, so tasty! Just waiting to cool and then I can pour! Thanks for the inspiration! Hey Julie! Hmm, your caramel should not be grainy. Did you thicken the cider down? Hope you love the cake! Next, that spider webby cake extravaganza!!!!! Any thoughts or suggestions on a different frosting for us? We have a nut allergy and although we could use sunbutter (sunflower butter…think sunflower seeds made into peanut butter like consistency) all of our family aren’t fans. Hey Bethany!! You can just omit the peanut butter from the recipe or us sunflower seed butter, which I think would be great! Let me know if you have questions. Thank you! 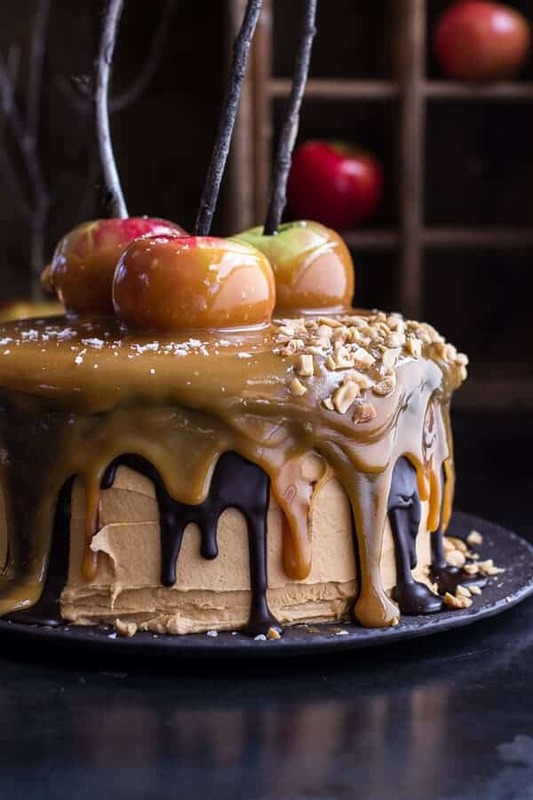 I have to say that I JUST finalized this incredible salted-caramel apple snickers cake and, if it tastes as amazing as it looks, then my guests will be in for a big treat. Like others, I had trouble with the caramel getting firm, but my husband told me to add more sugar and it worked like a dream. That homemade caramel is incredible. I can’t wait to taste the rest of the cake. I PROMISE to post a picture of my homage to you on Instagram. xoxo for sharing your talent. Yes I would love love love to see the finished cake!! I am so happy you love it Christine, thank you! This sounds so good. Will be aiming to make this over the weekend. Thanks. Hope it was delicious!! Thank you!! Hey Melanie! Yes, you can leave the cake at room temp for a few hours, but I would not let it sit out more than 4 or 5. Please let me know if you have questions. Thank you! Making the salted caramel apple cake. Your directions read to bring the caramel to a boil and then boil 10-15 minutes to get to 210. Boiling is 212 so curious where the typo is. Thanks. Hey Elizabeth, I am sorry but I am a little confused as to what you are asking, can you clarify? Thanks! I made this cake twice! I actually did it! The first time was a “practice” run and the second was for a fall party that I have each year. I bake a lot and wouldn’t consider myself a novice and I also am a decent candy maker, and I found this cake to be a bit challenging. The first one was pretty good and the second one was fantastic. It got lots of compliments and several requests for the bakery’s name where I got it. Surprised several to find out that I made it. The cake is delicious and oooey gooey and decadent. The biggest trouble that I had was with the caramel topping. The first time it was a bit runny and I had a hard time getting it to stay on the cake until it set. The second time I cooked it a little longer and let it cool almost completely before putting in on the cake and it set beautifully. The caramel also had an absolutely wonderful flavor. I may not ever make this cake again, but it was a lot of fun and put me to the test. Great recipe! Thank you! So so happy everyone loved this cake and it turned out great for you!! Thank you Greg! I think I’m gonna make this cake later this week. It looks and sounds fabulous! Wish me luck. What size flame should I have when doing the caramel sauce? I am a little nervous about this part of the recipe. Hey Lauren!! Medium high heat. Let me know if you have questions. Thanks! Thank you for this info. I baked the cakes last night and will freeze them until Friday when I will continue. Your welcome! Hope you love them! I just poured caramel and put apples on. I can’t wait to taste it! Yours is gorgeous! Mine not as gorgeous but not too bad for a novice. Fingers crossed it tastes just as good as it looks? Thanks for sharing! Ah I hope you love this Tisha! Thank you!! Making this beautiful creation for my daughter in laws B-day. Can’t wait to hear the cheers. Thank you so much. Awesome! I hope everyone loves it, thanks so much Christy! Hello, trying to make this cake and made the caramel last night but it seemed to separate when cooling. Any idea what I might have done wrong or how to fix it?? Any idea if the caramel will keep at room temperature? Hey erin, the caramel will keep at room temp for at least a week. Let me know if you have questions. Thanks! Ha ha, I am allowing myself to get agitated too soon. I stuck the caramel in the freezer and it has attained a consistency similar to what it looks like in your pouring video. So never mind. ? Sorry! Made the frosting and now to start putting it all together! Hum, the caramel thickened, I made the frosting, assembled, made the ganache, all was well…waited the 5 minutes, applied to top with the nice drips, put in fridge. When I looked at it the sides were collapsing. I stuck it in the freezer to halt this and when it stabilized, back to fridge. Left it overnight, feeling sad. I will not have that nice multi layer drippy edge thing and the side edges are not vertical. Looks bad. Guessing that there should’ve been additional time for cake to firm up before adding ganache? The end of the story: I wasn’t gonna get beat by some cake! In the morning I sawd off the collapsed edges, making them vertical again. I made a little more frosting and refrosted the sides. Stuck cake in freezer until frosting was really hard. Made more ganache and when cool, applied it to the top’s edge and pushed it over here and there to get the drips. Back to the freezer. Continued the recipe as shown. Back to freezer. The cake was firm enough to transport it over bumpy New Jersey roads for an hour. Stuck on the apples at destination. Cake defrosted while we had dinner and then we ate it until we were borderline ill. Then I remembered to take a photo which really looks like Cookie Monster. Where can I send it to you? ? I think we all just died when we saw this cake. One question about peanut butter… what exactly do you mean? I only use organic peanut butter, but I can get no stir which doesn’t have all the oil on the top. Would that be ok? I refuse to use JIF or any brand with hydrogenated oil. Ha, I forgot I changed that part. I used Trader Joe’s Natural PB and it is the crunchy kind, it does get stirred just when you open the jar. It worked just fine. Maybe there were tiny granules of peanuts but I think that made it better. I don’t remember noticing any though. Hey Shelley! No-sir will work great. Let me know if you have any questions. Thanks!! I’m gonna make this again for Thanksgiving. Now I know what I am doing. ? This time I will make sunflower seed butter since we have some peanut allergic people in the family. Or is there something that will taste better? Unsalted, I presume? And I will try to remember to take a photo BEFORE everybody has attacked it! I’m making this for Thanksgiving. I baked the cakes today. They look so yummy!!!! Do you think I could frost the cake today put in the fridge? Then do the ganache tomorrow and refrigerate over night? Then the last caramel sauce the morning of Thanksgiving? So over the course of 3 days. The caramel sauce would have to sit out on the counter for 2 nights? Does this sound okay? Thank you!! Can’t wait for the finished product and to eat it off course!!!! Hey Chelsie! Yes, frosting the cake works great! It is best to have the cake chilled when you pout the caramel and ganache. The caramel will be fine on the counter. Let me know if you have questions. Hope you love this cake! Thanks! This looks amazing, like, perfekt for my sister’s birthday, which is coming up! I was wondering, when making the caramel, can I substitute the bourbon and cider? Preferably with something non-alcoholic. You were not kidding, when you noted this cake is not for beginners… but so. worth. it! My sister loved it and so did everyone else, even though it didn’t turn out exactly as I wanted. Will be making this again!!!! Thank you ? I am glad you still enjoyed it! Thank you so much! How much applesauce do we use for this cake? I don’t see it in the ingredient list. And I searched through all the comments and no one else mentioned this. Maybe the ingredient list has changed. I made it anyway, since I was taking it to work on Monday and already had the other ingredients — using 1 cup of applesauce. The cake layers sunk a little in the center, but not much. But I would like to know how much is the correct amount in case I make it again. The cake came out great otherwise. The peanut butter frosting was great and the caramel sauce worked fine, although next time I will use all corn syrup. I didn’t care for the honey taste (used half honey and half corn syrup). I am so sorry for the confusion. I recently switched my recipes layouts and some of the recipes did not properly transfer. There is apple sauce in the cake! I will fix the recipe now. Thank you for letting me know! I am confused, didn’t the original recipe have 1.5 cups of applesauce? I came to reprint because my copy got messy, and noticed the applsauce is gone from the ingredient list. I have made this several times as a cake and cupcakes and it was always amazing with the applesauce. Hi Michele, I am so sorry for the confusion. I recently switched my recipes layouts and some of the recipes did not properly transfer. There is apple sauce in the cake! I will fix the recipe now. Thank you for letting me know! wah!!! what a lovely cske!!! Its decoration as well as its tasteis also very nice. Thanks!!! I am so glad you loved this! Thank you! I’m hosting BUNCO in November and this will be my showstopper at the midway break. I found your answer about coffee over apple cider. I’m not a coffee drinker, but am willing to try it. Is there a strong coffee taste? Also, can I use cake flour or does it have to be AP? Hi Jill! No the coffee will not leave much of a taste at all and yes, cake flour will be great! 🙂 Let me know if you have questions. Enjoy the cake! I’m sure I like the idea of that much apple sauce…could I reduce and add butter? Awh, sounds so great! Thanks Laura! Hi ! Im making the cake now and all went sell until I put the chocolate on top. In melted everything away … I coolt it down for 5 a 10 min … should I wait longer? I love all the flavors already and I’m exited to see him tomorrow. My sister recently passed away suddenly from cancer. At her Memorial we had a pot luck and I knew I needed something that was a “show-stopper”. I found this recipe which not only looks stunning, but has all of my late sister’s favorites. Thank-you so much for sharing the recipe, I know my sister was smiling down on us. I am so sorry to hear that your sister passed away. I hope you and your family are all doing alright. I am really glad you found this recipe, though. Thank you! So excited to try and make this cake this weekend!! Quick question, I only have one cake pan.. does the baking temp or time change if I do one layer at a time in the oven? Hello! I can’t wait to make this cake for a Halloween dinner party. Quick question – my refrigerator can’t fit the cake in it with the apples and branches poking out. Is the last refrigeration of 30 minutes to set the caramel necessary? Or can I place the caramel apples to the side and place them on later? Thank you! Looks like an AMAZING cake, I am having real trouble with converting the American measurements in cups into British measurements, there are really big differences on the conversion charts from cups to grams. Could you help me out with this? Hi Sophia! I am so happy you’re loving this cake, thank you! I do use an online calculator to convert, so I will link the one that I think will help you best! It converts all measurements for you pretty easily. I hope this helps, but if it doesn’t just let me know and I will try to help you out further! That’s great! thanks for the link. Just gearing myself up for a baking extravaganza and total sugar overload…every Wednesday needs this! What’s the consistency of the caramel sauce supposed to be after boiling the second time (I.e., for 10-15 minutes). Is it funnier and then will thicken, or should have most of the moisture evaporated , leaving a thick sauce pre-cool? I made this cake for my Halloween party. It was amazing! Very decadent. I was expecting a big mess when serving it, but it wasn’t. Everyone enjoyed it! Thanks. I just love your photos and this recipe! I’ve been eyeing it for a while and now I’ve found to perfect opportunity to bake it! 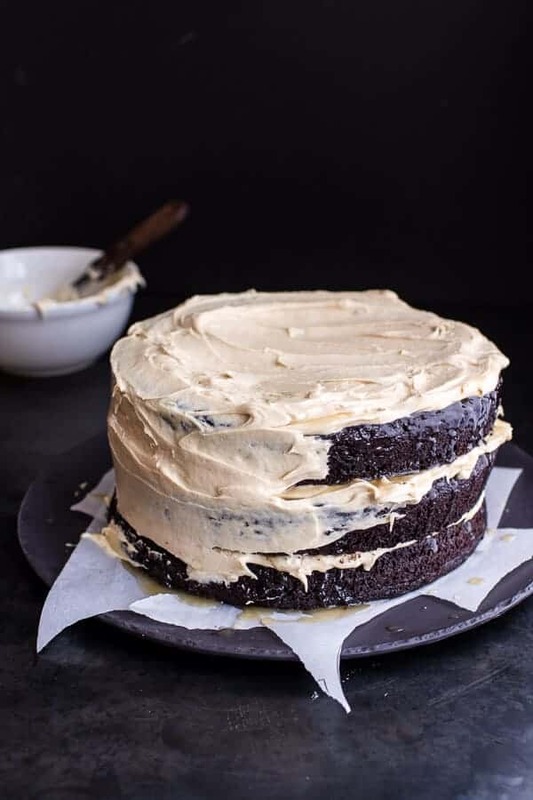 I will have to adjust for the peanut butter frosting because of friends with nut allergies, so I am thinking of adding just a hint of coffee powder to the frosting instead. I am just wondering: I have never used this many cacao powder in a cake before. Won’t it make the cake very bitter? I have to say that it was utterly delicious and decadent. I made a mashup of this cake and this one: https://www.halfbakedharvest.com/chocolate-bourbon-caramel-macaron-cake-to-celebrate-my-little-kind-of-big-secret/. It was a very big cake (I still have a lot leftover – not that I am complaining! ), and the flavours where amazing. I should not have doubted the amount of cacao powder. I’ll keep this recipe in my book for future makes! I am so glad you loved this! Thank you Esther! Gonna try and make this for thanksgiving….but I’m super psyched to make it and know I’m gonna take forever on the decorations….how early in advance do you think I could make it? I made this cake last weekend for a party, and it end-up as the center piece!!! It was so delicious!!! The tasting turned into a competition to guess the flavors in it…they even tasted coconut!!! HAHHAHA…. I do have a question though, the caramel ended up being a little harder than I expected and since it was in the fridge all the time you suggested, It made the cake a little harder than on your pictures. Since I am making another one in two days for Thanksgiving, should I just add more heavy cream if I think its still too hard…? Also, since I only have one pan to bake, how long shoud I keep it in? Made this cake tonight. It turned out great! I will be making it agsin tomorrow! I am so glad to hear that! Thank you Susan! This cake was amazing! I have made it twice now. The first time I followed timing exactly and it was the most moist cake I have ever had. the 2nd was a bit drier and I rushed it in a day and it did not work nearly as nicely. It is a time consuming cake for sure, but your guests will love this cake. Awh that is amazing to hear! I am really happy you love this cake James! I made the caramel this morning and it was really thin. I put it back on the stove and cooked it to the soft ball stage, I believe it got to 240*. I believe the temperature in the recipe is way too low. Am I doing this all wrong? I’m making the cake for my sister’s birthday, which happens to be on Thanksgiving this year. I’m excited to see her face when I walk in with this gorgeous cake. Thanks for the recipe! I hope you all loved this!! Thank you Samantha! That looks amazing! I swear I could smell it as I read the recipe! I may just have to try it! I hope you love this cake Kirst! Thank you! First of all, I LOVE your recipes, I’m so happy to see that you have a cookbook that I can now buy and use over and over again! I made the caramel snicker cake last Christmas, I made it gluten free, and OH MY GOSH was it a hit! There was just complete silence during everyone eating it, we all LOVED IT! I did not do the caramel apples on top (I was not that brave), but I’m hoping to try something new again this year, even though every one is begging me to make the caramel snicker cake again! Thank you so much for your amazing photos, wonderful delicious recipes and your joyful posts! I am so thrilled you and your guests loved this Dana! Thank you so much! Tieghan, this is the most amazing cake I’ve ever seen before! Simply blew me away. I just made this cake, and it is so delicious. I can’t believe how moist it is! I thought it sliced beautifully. My caramel sauce was a bit thinner, but it was thick enough to create a layer over the chocolate, though not as visible as yours. In the crunch for time, I didn’t get to put the caramel apples on top of the cake, and also I used semisweet chocolate instead of bittersweet chocolate for the top layer (because I had that on hand) and it was yummy. The freezer was my best friend for firming up the frosting and chocolate/cream layer quickly. Everyone loved this cake and I would definitely make it again. I made this cake twice over the span of 4 days, the first one (practice run) came out perfect! I typically struggle with caramel, but it went off without a hitch! 2nd one (was made for a fund raising auction) I struggled a bit with the caramel (i’m positive it was because of my own impatient fault, somehow) but I managed to salvage it and the cake came out beautiful and amazing and was THE hit of the night!! I recommend take your time AND give yourself time to work thru it. I’ve never had spiced chocolate cake before, and i’m not a huge fan of chocolate cake, but I really like this flavor combination! This is definitely one that makes a big show-stopping splash and has the flavor profile to back up its beautiful looks! I’m currently making this cake! I made the caramel and cooked to 220 (oops!) it’s very hot still but liquidy, not really thick at all. Is this how the first round of caramel is supposed to be? This is the best cake in world :)))))! I will make it again! I made this cake, and while it was challenging for me, it was TOTALLY worth it!!! I made it for a special person’s Fall birthday and it was incredible! Thank you so much !!! Thank you so much Therese! Hi Tieghan! I am in love with this cake and I just noticed you are a gellow Coloradoan! I live in CO at 6,300 ft. I didn’t rrad that you speficially mentioned any high altitude changes for this bake. Is this recipe already adjusted for high altitude or written for sea level? I am so excited to make this cake. Hi Erin! The recipes on my blog should work great for you! Please let me know if you have any questions while making though! Hi Tieghan. First of all, your cake looks amazing! So much so that it instantly inspired me to make it, even though I’ve never made something this complicated before. I know it’s been a long time since you posted this, but I’m hoping you can save me! I’m currently making the caramel (the three cakes are in the fridge since yesterday, chilling!) So, I’ve followed the instructions, but I don’t have a candy thermometer so I don’t know if the caramel is done.. this is for the first bit, so it can be added to the frosting. How thick does it need to be? It tastes good but it’s currently rather funny.. I wonder what consistency it should have.. Here’s hoping you see this, otherwise I’ll improvise.. eeek! It does not state how many eggs to use in the cake. Dying to make this. Long, long ago (probably back when this recipe was first released) I came across this page and knew I had to someday make this cake for my birthday (which is October 17th, funny enough). Well, this year was finally the year! As I’m sitting here eating a frozen leftover piece of cake I realize I have to document my experience. This is going to be a long but informative review so stay with me. .. And for the chocolate ganache I just winged it. Double boiled some unsweetened baking chocolate with some coconut oil and added some coconut milk powder to make it creamy and about 1 tblsp of the salted caramel to make it just a touch sweet. I am lactose intolerant, so I had to make substitutions for the dairy. If you want to make it vegan, you can probably also use your favourite egg replacer for the cake, and follow a vegan recipe for caramel. I used apple juice in place of the apple cider and alcohol because I don’t drink and couldn’t find a friend to take care of the leftovers. I also reduced the sugar in the cake because HOLY CRAP, A SUGAR TO FLOUR RATIO OF 1:1?! Tieghan! Girl, I am not big on sugary sweets but even my friends couldn’t handle my cake with the reduced sugar modifactions! Way way way too sweet on the cake there. My rule of thumb for cakes is if it’s going to have sweet toppings, I try to make things bitter to balance it out. 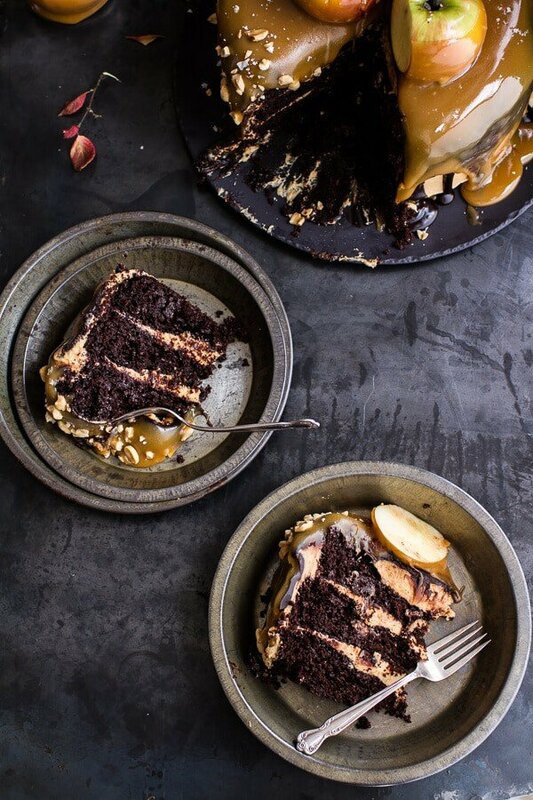 Dark chocolate bittersweet cake, sweet Pb frosting, bittersweet chocolate ganache, then SWEET AF CARAMEL THAT IS LITERALLY RICH HONEY. I chose MacIntosh apples to slice and arrange on top to lend a bit of tart to each bite, and stuck crushed peanuts up the sides of the cake because if you’re like me and can’t frost to save your life you’re gonna need something to cover up that mess. I was a hug fan of the cake. It is subtly spiced, deeply chocolatey and perfectly sweetened with my sugar Modifications and accidental inclusion of sweetened applesauce. One complaint I do have though is that there is so much vanilla required for this recipe! Like holy crap, I used a third of a new and expensive bottle of vanilla on this thing. I don’t believe that so much is required for this recipe, and in the future I’d reduce the amount. The frosting tasted great albeit a little sweet and buttery, but since I used natural peanut butter the consistency wasn’t quite right, which I expected anywho. If anyone else is looking for a healthier modification as well, I’d suggest trying powdered peanut butter, keeping the dry ingredients on hand to add as necessary and per taste. The caramel was a lot richer (fattier) than I expected, and the consistency wasn’t quite right for me, which I know is probably due to the ingredients. I was surprised that no matter how long I left my mix boiling on the stove, it couldn’t quite reduce to the candy caramel I used to know and love :'( next time I need to make vegan caramel I’ll just follow a recipe that doesn’t use honey, since my caramel just ended up tasting like buttery honey rather than caramel. I highly recommend slicing tart apples and arranging them on the top of the cake! It adds a much needed fresh and tart taste to every bite. I dipped mine in caramel and then put them on top, which preserved the freshness. If I were to make it again I would also put apple slices in between the layers of the cake. Also I have to note that since there is so much butter and oil in the frosting, ganache, and caramel, I’d substitute some of the cake oil for more applesauce. That’s a bit more of a personal preference, though. Aaaand I think that’s it. To any readers who got this far, I hope you’ve found something helpful in my review. Overall it was a delicious cake, and I think the reduction of sweetness in certain elements really helps. Thanks to Tieghan for posting this recipe and keeping me salivating for 4 years! Hi Ameris! I am so glad you liked this cake and left modifications for others that cannot eat dairy! I will take note of your comment for future recipes, thank you so much! thank you so much for this recipe! I made this cake for halloween with a friend. It was a complicated and long process, but the result was amazing! The only thing we would change is to use more apples. Maybe very thin slices between the layers to give it a little bit more freshness. Otherwise it really was a feast and our friends were amazed! I am so glad you liked this recipe, Daniela! I hope it turns out more amazing next time with your changes! Thank you! I’d love to make this cake but I have a nephew with a peanut allergy. What would you suggest as a substitute? Thank you! Hi! This cake looks amazing and I’m going to be attempting it for a Thanksgiving celebration this weekend! I do have a two hour car trip.. do you think it will make it or should I save it for another occasion? Thanks!! I am going to the store to get the ingredients for this cake! In the comments people speak about bourbon, but I don’t see it in the ingredients. What am I missing? I hope it does have bourbon! Can this cake be made ahead and if so, what is the refrigerated life? I am wanting to make for Thanksgiving and would like to make it about 4 days prior to serving. Also what is the difference in using coffee vs apple cider? I am making this and so far the caramel isn’t getting thick. I used light corn syrup should I have used dark. My chocolate ganache is thick and looks sandy. Any suggestions?I feel like throwing it out. Hey Jane, can you give me some details on how you made this? How did you melt the chocolate? When it turns sandy that usually means it has been burned. Hi Becky! I am so sorry to hear that. Is there any questions I could help you with? I am not sure what happened exactly. Thank you! Hey Cathy, did you change anything about the recipe? Any more details you can give would be helpful in problem solving. My kids love this cake for their birthdays! Do you think there’s any way to make it as a sheet cake? I just made this for a Birthday Party Brunch. They were amazed. I got comments like “Best Choc Cake ever!” and “this is a work of art”. THey loved it. This is a PROJECT to be sure but it was worth it and so much fun!! Thank you so much! I am so glad you loved this and had the best time making it!